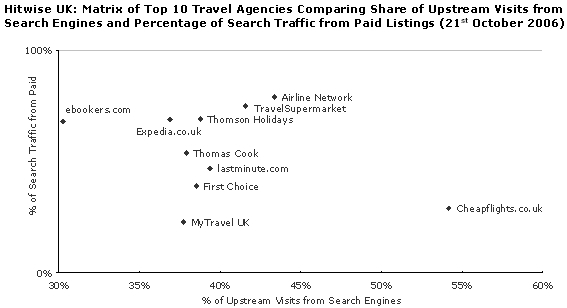 Travolution Blog: Who gets their traffic from PPC? Who gets their traffic from PPC? Heather Hopkins from Hitwise has turned up some interesting data revealing how much traffic the top ten travel websites bring in from sponsored links in search engines. The diagram below – from the week ending 21 October – indicates how much traffic the ten receive from search engines (horizontal) against how many of those same visits come in via pay-per-click ads. The first site to stand out is price comparison offering Cheapflights, which brings in around 55% of its overall traffic via search engines, but only around a third is from PPC click-thrus. 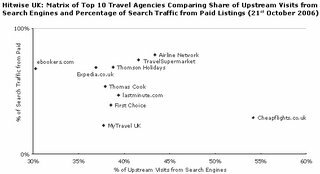 The nearest any of the remaining nine sites gets to Cheapflights with its share of traffic from search engines is Airline Network, at around 45%. Contrast Cheapflights with online travel agency Ebookers, which has admitted to serious problems with its search engine optimisation in recent months and is only bringing in around 30% of its overall traffic from Google, Yahoo! et al. Ebookers’ share from PPC is around two-thirds of its overall search engine traffic. Hopkins says: “The lesson for marketers is that there is no hard and fast rule for the right mix of paid and organic traffic. Instead, marketers should examine return on investment from specific campaigns whilst constantly testing and adjusting search campaigns.